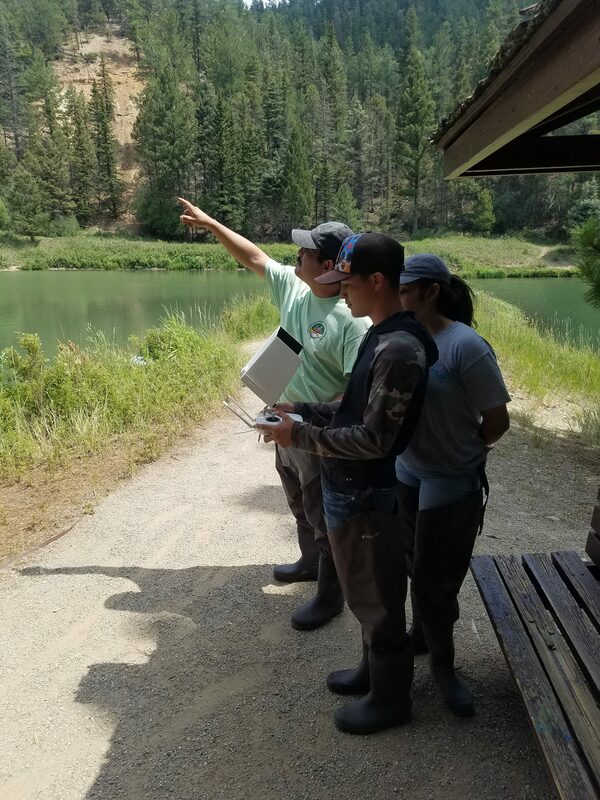 Dominic Torres is what people know me as — I’m one of the special two to get chosen on this internship opportunity with River Source. This experience gave me chances to do hands on stuff that I wouldn’t have been able to do anywhere else. I want to succeed in wildlife biology after my last year of high school coming up soon. Being able to be out there with Rich and Carlos gave me a good view of what other things I could do out in the back country I call my home. Now I know a lot more in depth of the Red River and what possibilities we could do to make a better safer place for our visitors and our fish in our beautiful country. We were able to observe the campsite June Bug, the Fawn Lakes, and Eagle Rock Lake. On this internship I learned which plants were invasive species and which were not. For example we were able to spot Canada thistle which I never knew the name of — that piercing looking plant. I just knew if I ever went to touch it…… it wasn’t going to end well. On all the locations we went to we were able to find erosion either caused by runoff water or by us humans and our job was to think of a way to stop it. At all the locations of erosion we GPS to show the Forest Service which areas are a problem or what might become a problem once a flood might occur. Water quality!!!! What fun practicing, from collecting the pH of the water to collecting bugs on the bottom of the river that you would never know that were there. Pretty cool seeing the bugs living in the water of the river. Now I know which flies to use when I’m out fly fishing. We were able to find a lot of mayflies, caddisflies and a few others. The most nervous and most exciting part was flying a drone. When I first heard we were gonna be able to fly a drone I was super excited but I also had anxiety knowing that this drone is worth over $2,000 and couldn’t mess up at all. I remember when I first held the remote I was even shaking a little bit. I freaked out how high quality the camera on the drone was — it honestly looks clearer than my own eye. We were able to use a laser level which I had been able to use doing construction. This opportunity also gave me the chance to get more experience using this kind of level. 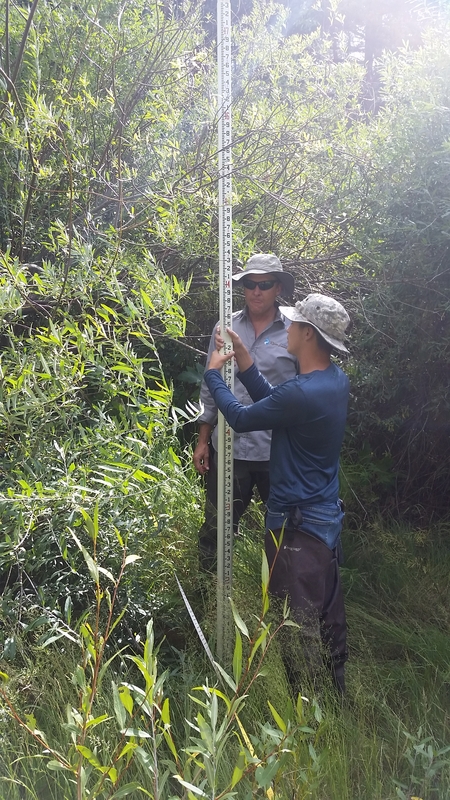 We used this level to find out how much the river descends down the valley and to make sure the rivers running at its best and not any higher points by Fawn Lakes that could cause flooding. 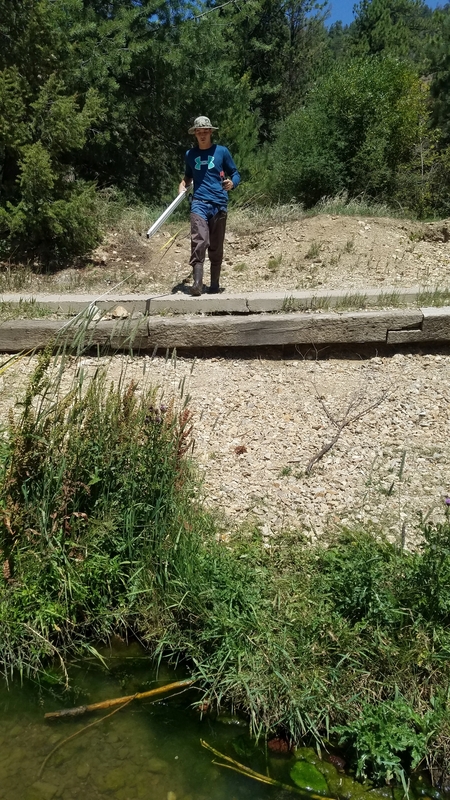 By using this laser we were able to also measure the depth of fishing holes and the sequence of water flowing downstream. I had a very cool experience keeping cool walking down the river. I just want to give a big thanks to Rich, Carlos and Emily for sharing some of their knowledge with me and making this opportunity happen. I thank the staff of the Forest Service (George Long, Richard Holmes and Eric Garner) and McCune Foundation as well. 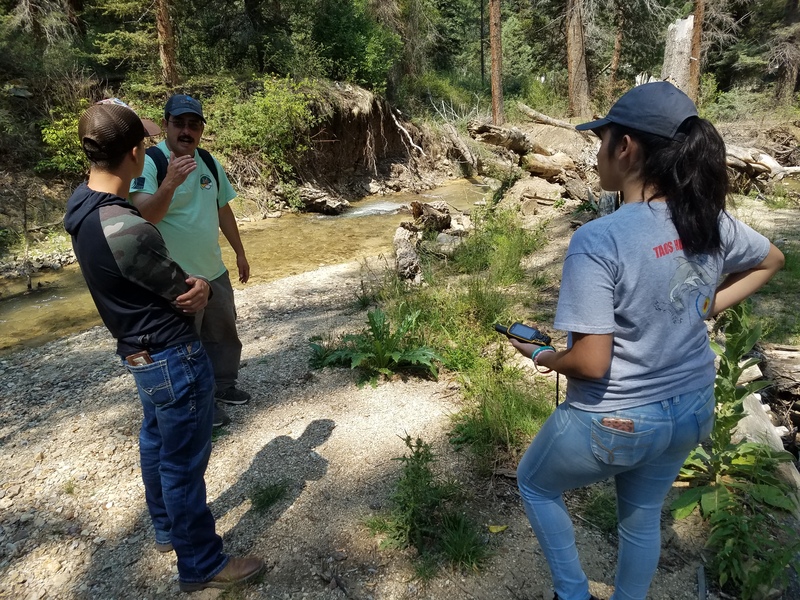 This experience and the opportunity that you gave me was a huge help for me to see if I want to keep following in the direction of my dream working for the Forest Service. I hope one day I could be going to work walking through the doors of my hometowns Questa Ranger Station. We are so grateful to the McCune Charitable Foundation and the United States Forest Service for making this internship possible!